Track Tested CorkSport Approved 3rd Gen Mazda 3 Parts – Leading the Pack. The last race weekend I had available before the runoffs turned out to be pretty interesting. 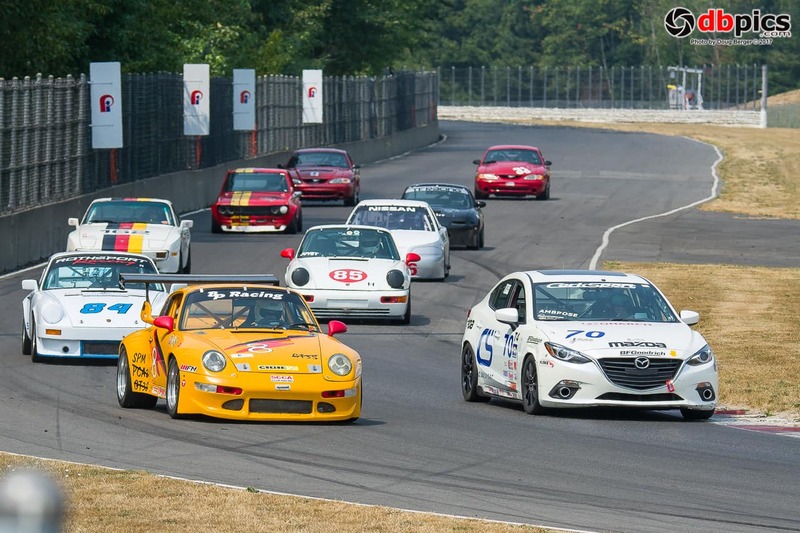 Locally there are very few T4 (touring 4) class cars so I often find myself running with other class cars and this weekend was no exception at Portland International Raceway. I showed up for qualifying on Friday morning with a new part to test and a suspension setup with something I had not tried. I looked over the entry list the day before, and there read a list of cars you would expect to clobber a Mazda 3 on the track. 3 Porsche 911s, a pair of V8 mustangs, an STL Miata and more. To make sure I had a clear track for qualifying, I hustled to the pre-grid to make sure I was the first car out. Straight out of the pits, I went flat out to get some distance on the Porsches to be able to push the car for the entire time I was out qualifying. As I watched the lap timer in the Mazda 3, my times kept dropping lap after lap. 6 laps in and I had already bested my fastest lap time at Portland by a second, so I called it quits and pulled in to the pits. On the way out of the track I grabbed the time sheet to review and see where I placed. A quick review of the sheet showed I had qualified the Mazda 3 in second out of 10 cars and I was in front of 2 of the Porsches. The start of the race didn’t go that great. Out of all the cars on the track I was in the bottom ½ for horsepower. But I was making up the speed in the corners. One of the back cars jumped the start a bit and managed to take us 3 wide into a corner which is only good for 2. I was forced to give up some room to one of the Porsches to keep from having contact which put me back to 4th. Several laps into the race one of the Porsches who got ahead of me at the start spun off the track so I was able to move back up a spot while trying to chase down the leader who was running ~1 second a lap faster than I was. The 30 minute mark came pretty quick, and the race ended on a not-so-exciting note of me being in 3rd, and the leaders ~ ½ a lap ahead and all but a few of the rest of the field being lapped. We made an adjustment with the CorkSport rear adjustable swaybar. Being able to make quick adjustments on the rear swaybar bar allows us to soften the suspension to match the alignment changes. We had taken more rear camber out of the back of the car with the CorkSport adjustable camber arms, trying to decrease rear grip (yes you read that right). We have been having problems with front end push (understeer) so we worked on dialing rear grip out of the car. – We had the CorkSport front camber plates maxed out for camber to the class limits, but it wasn’t enough to offset the rear grip. We originally were running our CorkSport Mazda 3 adjustable shocks on the track but we had to remove them as they are not legal for the Touring 4 class. The adjustable shocks make a world of a difference over what I have to use on the car and I wish we could’ve changed back. Being able to fine tune the Mazda 3 suspension is a great asset for any performance driver. The engineers here at CorkSport have been working on a revised Mazda 3 Rear engine mount for the 3/6/Cx5 over the past few months. The best way we have to extreme test parts is on the track. Think of the race-testing this way: I am driving full throttle, banging gears, and when I am off the throttle means I am on the brakes, so there is no time for the mount to get any rest. There is the maximum amount of heat, load, and stress in a compressed time line, compared to street driven cars, so if failure is to occur it would be on the track. 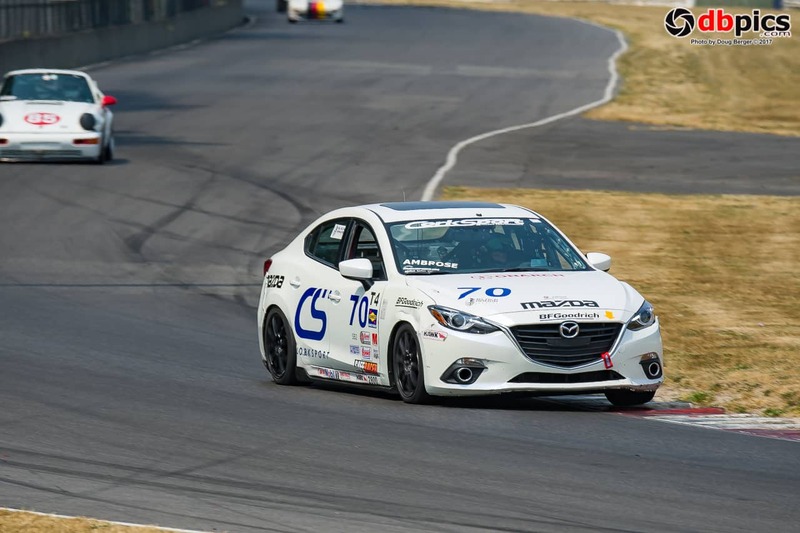 At the end of the month, I will be doing a test on a final version of the rear engine mount at the SCCA Runoffs and competing to bring home a National Championship for CorkSport and Mazda. This brings me to my next point: All of the parts mentioned above have been punished on the track and had zero failures. I have been on the same rear sway bar, rear camber arms, camber plates, and short ram intake, and cat back exhaust since we started racing the car at Daytona in 2015. You just can’t beat the fact that our CorkSport parts walk the talk when pushed to the extreme, which means they won’t let you down, no matter what you’re doing. Previous PostPrevious We want YOU to help us design the next CorkSport Branded Ride! Next PostNext Dear Car Clubs: We Want To Hear From You!